A young drug-driver stopped just before midnight told a court he had probably been going through the roughest time of his life when it happened. Clark Pinder had derivatives of cocaine and cannabis in his blood after he was pulled over on Barrowford Road in Nelson because a light was not working properly on his Alfa Romeo. Police then smelled cannabis on him. 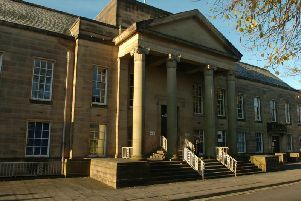 Mrs Alex Mann, prosecuting, told Burnley magistrates: "I'm not told of grave impairment in the defendant's driving." The hearing was told how 23-year-old Pinder was tested and was found to have 72 microgrammes of benzoylecgonine per litre of blood. The specified limit is 50. He also had 4.5 microgrammes of delta-9-tetrahydrocannabinol per litre of blood. The amount allowed is two. The defendant, who was not represented by a solicitor, said at the time he was being bullied at work including by his boss. He had just lost his girlfriend of five years in "quite embarrassing" circumstances. Pinder told the hearing: "I was seeing a stress counsellor for my anxiety problems. I made a silly mistake." The defendant continued: "I thought I had waited long enough for the effects to wear off and two minutes from my house the inevitable happened. I got pulled over." Pinder told the Bench he had embarrassed his family and went on: "There is nothing more embarrassing than having to stand before you today. I never thought I would be in the position I am in today. I really am ashamed. It's not a representation of who I am." The defendant said since the offences, he had turned his life around and had got a new job. He added: "I'm quite proud of where I am today. I'm just not proud of the situation I am in. I'm really not." Pinder, of Harpers Lane in Fence, admitted two counts of driving with a proportion of a specified controlled drug above the specified limit last December 22. He was fined £300, with a £30 victim surcharge and £85 costs, and was banned for a year. The defendant had no previous convictions.